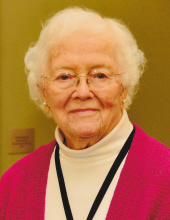 Patricia A. Haas, age 95, passed away on March 27, 2019. Patricia was born in Milford, Michigan to John and Zelia Mahoney on May 15, 1923. She is survived by her sons H. Thomas (Carol) Haas and Joseph W. (Mary) Haas; grandchildren: Gerald and Virginia Gillis, Nicholas and Lane Haas, Kirsten (Dan) Hylwa, Marybeth (Darren) Saccone, Kathryn Haas, Patrick Haas, Eric Campbell (Michelle Marie) and great grandchildren: Jacob (Kate) Gillis, Emily Gillis, Eric Joseph Campbell, Megan Campbell, Sam Campbell, Leo Campbell, Deanna (Blake) Schaeffer and Darren (Christy) Saccone. She is preceded in death by her husband Harold and daughter Maurine. To send flowers or a remembrance gift to the family of Patricia Anne Haas, please visit our Tribute Store. "Email Address" would like to share the life celebration of Patricia Anne Haas. Click on the "link" to go to share a favorite memory or leave a condolence message for the family.